Northeast Nigeria continues to experience conflict-related restrictions to food access and availability. Between July and September, Borno State, as well as much of Yobe and northern Adamawa States will be in Crisis (IPC Phase 3), with worst-affected areas, including Maiduguri IDP settlement areas, experiencing Emergency (IPC Phase 4) acute food insecurity as households face larger food consumption gaps with increased risk for acute malnutrition and excess mortality. In northeast Nigeria, main season harvests, which will begin in October, are expected to be significantly below-average for the third consecutive year, limiting household availability of own production stocks, as well as market supply. Although October harvests will improve food availability somewhat, much of Borno State and parts of Yobe and Adamawa States will remain in Crisis (IPC Phase 3) between October and December as households continue to face difficulty meeting their basic food needs. Households throughout much of the rest of Nigeria will benefit from stable market prices for staple cereals and average seasonal incomes through September. New harvest stocks beginning in October will contribute to good markets supplies and a seasonal decrease in market prices. Below-average cereal prices and good sale prices for livestock will lead to favorable livestock-cereal terms of trade. Between July and December 2015, most of Nigeria will be in Minimal (IPC Phase 1) acute food insecurity. The onset of the growing season began timely in most of the south of Nigeria during February and March. Agricultural households are largely engaged in crop-tending activities. Similar conditions are seen for groundnut and potato cropping in the south of the middle belt region. Localized incidences of erratic rainfall during the bimodal first season did lead to somewhat below average production for the first harvest, but the below-average production has seen limited impact on food prices. 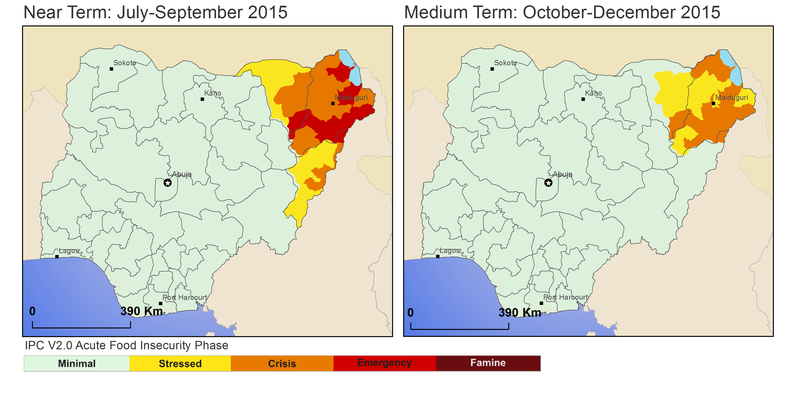 In central and northern Nigeria, the season began late across much of the region in June and July (Figure 1). The delayed start of the season resulted in late planting in many areas in both northern and central states. By mid-July, however, typical levels of rainfall had begun to resume and farmers either began replanting or continued crop-tending activities depending on the location. Despite the delay to the rainfall season, reports indicate agriculture wage labor activities are providing typical levels of income for poor households during the cultivation season in most parts of the country. Livestock body conditions remain in line with seasonal trends across much of the country. Market supplies have declined after the Ramadan holiday after households reduced sales of livestock as the increase in demand ceased after the holiday in July. For pastoralists in northern areas, prices for livestock feed are rising, in line with seasonal trends, but also due to the relatively limited pasture availability due to the limited rainfall accumulation at the beginning of the season. On Minna market, prices for crop residuals sold for livestock feed have more than doubled compared to previous months, contributing positively to household incomes for poor, agricultural households, but increasing costs for pastoralist. Following the high levels of demand for livestock seen for the Ramadan holiday, pastoral households are again earning seasonally typical incomes from livestock sales. In June and July, traders were releasing their cereal stocks to meet social obligations during Ramadan and in expectation of the main harvest in October. Similarly, better-off households have been releasing their stocks to purchase inputs (seeds, fertilizer, etc.) and hire labor for the main cultivation season. Prices for staple cereals continue to see a typical seasonal increase, though, on markets in both surplus- and deficit-producing areas. In June, millet prices increased by 8, 4 and 11 percent on Gujungu, Dawanau and Aba markets, respectively when compared to May prices. Similarly, white cowpea prices increased by 11, 10 and 5 percent on Dodoru, Dawanau and Aba markets, respectively when compared to previous months. However, staples cereal prices continue to remain below 2014 prices and five-year average prices for June. Good household and trader stocks have led to good availability on markets, contributing to the below-average prices. Inter-communal and farmer/pastoralist conflicts continue to impact food security in some areas. Inter-communal conflicts in Bauchi, Benue, Kaduna, Nasarawa, Plateau, and Taraba States continue to disrupt agricultural activities and, in some areas, markets as well. Farmer/pastoralist conflicts are also common in these areas, contributing to high levels cattle rustling. Cattle rustling is also of concern in Katsina, FCT and Zamfara States, resulting in numerous casualties and in many instances loss of livelihoods for affected pastoral and agropastoral households. Although these conflicts typically affect only localized areas at any one time, in some areas the impacts is of substantial concern. Recently, in Zamfara State, cattle rustling in Maru, Bungudu, Tsafe and Gusau Local Governments, affected a large number of households in the major staple crop-producing area of the state, limiting crop planting and pastoral activities. Food availability and access across much of the country, particularly for poor households, is at a seasonal low during as much of Nigeria moves into the lean season. In southern and central states, limited food access is slightly tempered by the increased staple food supplies from early green harvests. Off-season harvests in central and northern states also contribute to food availability. This, in combination with good levels of household stocks from previous harvests, is contributing to seasonally good household food availability. Households are also earning average seasonal incomes; for poor households these incomes come primarily from agricultural wage labor or livestock sales. For households that are market-dependent for their food needs, including pastoral households and agricultural/agropastoral households that exhausted their harvest stocks, below-average prices contribute to good market access. Persisting Boko Haram conflict, which has been largely concentrated in Nigeria’s northeast and neighboring regions of Niger, Chad and Cameroon, continues to result in numerous casualties and contributes to ongoing population displacement. A recent assessment by FEWS NET to the northeast noted that in rural areas highly affected by conflict, nearly three quarters of the population has left for urban centers in Borno, Yobe and Adamawa, or to neighboring states and countries. As of June, Boko Haram conflict had contributed to the displacement of more than 1.3 million people within Nigeria (IOM/Nigeria NEMA). Most Internally Displaced Persons IDPs have fled to urban centers, with the vast majority - over 80 percent - coming from Borno State. For these displaced households, it is estimated that less than 10 percent are in camps. Most IDPs find themselves in informal settlements or with host families. Conflict also continues to prevent households from pursuing their typical livelihoods. Due to ongoing conflict, resident households in affected areas are not planting as much as they typically would. This limits not only household production, but also limits household access to agriculture-related wage labor. As most IDPs are in urban centers, they have little to no access to land. Some IDPs have been returning to their homestead, as has been indicated in reports from the northeast and the most recent IOM/Nigeria NEMA Displacement Tracking Matrix report, but they only account for about a 15-20 percent of the total IDP population. Most are returning to northern Adamawa State. Reports from FEWS NET key informants indicate that in Borno State, some displaced households have been returning to parts of Damboa, Chibok, Benisheikh, Nganzai, Kukawa, Monguno, Magumeri, Gubio and Konduga Local Governments, as well as parts of Gulani and Gujba Local Governments in Yobe State. As the security situation in northern Adamwa State becomes more stable, some households have been returning to parts of Mubi North, Mubi South, Maiha and Hong local governments. As planting in northern Nigeria typically needs to occur by July for crops to fully benefit from the West Africa monsoon season, displaced households that have not yet been able to return would likely not be able to participate in main season agriculture were they to return in the coming weeks or months. Major urban markets, including in Maiduguri, Biu, Potiskum, Damaturu, Mubi, and Yola, continue to operate (Figure 3), though are functioning at below normal levels due to limited demand, disrupted trade routes, and below-average local production. Cross-border trade activities along Yobe, Adamawa and Borno States borders with Niger, Chad and Cameroon are still at informal levels. Most semi-urban markets and local markets are experiencing greater impacts from the conflict and have further limited functioning. Additionally, as the northeast typically supplies markets across northern Nigeria and neighboring Niger, Chad and Cameroon, many markets outside of conflict-affected areas are also experiencing indirect impacts from the conflict. Trade routes between the northeast and other regions are disrupted and trade flows are at below average levels. This has also contributed to high purchase price for key staple cereals on most markets. Households highly affected by conflict in Borno, Yobe and Adamawa States had limited own production stocks in 2014 and early 2015 as conflict restricted their agriculture activities again over the last year. These households have exhausted their own production stocks much earlier than they would in a typical year. Agriculture related labor opportunities, which typically would contribute significantly to food access in a normal year, remain restricted due to security concerns, limiting food access. This is further compounded by limited market functioning in most conflict prone areas. Current assistance programs from the Government of Nigeria and humanitarian actors are mainly targeting camps and urban populations. The Nigerian Government through National and State Emergency Management Agencies (NEMA/SEMA) are providing food and non-food support to the IDPs in various camps in the northeast. There is an increased presence of humanitarian actors in the northeast as well, both amongst national and international aid agencies. Displaced households in urban areas also rely heavily on community assistance in attempts to meet their food needs. Access for humanitarian organizations to rural, resident households still remains limited, though. Households that have remained in areas directly impacted by conflict continue to rely very heavily on community assistance and assistance from relations who are able to return to the homestead from time to time. Boko Haram conflict: Conflict is expected to continue at current levels through at least December. Trade flows and market activity will remain restricted as traders continue to evade conflict areas and local production remains limited, particularly in Borno, Yobe and Adamawa States. Conflict will also keep households from their typical main season cultivation activities, now for a third year in a row. Local production in the northeast, with main harvest beginning in October, will be once again significantly below average. Rainy season: Although there was a late start of the season in central and northern areas, forecasts call for average to above average accumulation for the rest of the rainy season, which will end in October/November. The continuation of average to above-average rainfall performance is expected to make up for many of the rainfall deficits seen early in the season (Figure 4), although impacts on harvest production are still expected due to the late start of season. Seasonal forecasts for the bimodal south, however, indicate below-average precipitation expected for the second season. Flooding: During the peak of the rainy season between August and September, typical levels of flooding are expected to occur in flood-prone areas along major rivers. According to the Nigeria Hydrological Services Agency (NIHSA) the high flood risk areas include Sokoto-Rima, Niger-Benue Basins and parts of Anambra Basin. Coastal flooding in parts of Bayelsa, Rivers, Delta and Lagos States are also likely. Agricultural inputs: The supply of major inputs, including fertilizer, will be average through September for the main cultivation season. Subsidized fertilizer prices are expected to range from NGN1,000/bag to NGN3,500/bag depending on the state, as against NGN6,000 to NGN7,000/bag on the open market. Main harvest: The 2015/16 main harvest is expected to be near average at the nation level. However, some localized, below-average production is expected. Parts of central and northern Nigeria that experienced a delayed start of season could see decreases in harvest yields. Similarly, areas in the south worst-affected by the forecasted below-average rainfall could also see a reduction in harvest yields, although cumulative rainfall in southern Nigeria typically exceeds crops requirements even in below-average years. In conflict-affected northeast Nigeria, agricultural production will for the third consecutive year be well below average. Pasture/water availability: As the season progresses favorably, pasture availability and watering points will also increase. Pasture is expected to be readily available to the pastoralist through at least December. Livestock body conditions: Animal body conditions will follow normal seasonal trends between October and December as pasture and water availability remain good after the rainy season. Livestock markets: Livestock demand will remain relatively strong with two further peaks in demand by September and December. Demand will be high in September for Tabaski and in December for Christmas and New Year. Due to this seasonally high demand, livestock prices will be favorable for pastoralists during the entire outlook period through December. Agricultural labor: Labor supply will likely continue to be below average due to reduced migratory labor from neighboring countries as the conflict persists in the northeast. Wages from agricultural labor activities will be slightly above normal level in most areas of the country and will follow normal seasonal trends. Wages will peak during periods of high demand for weeding and fertilizer application activities in August/September and for harvesting activities in October/November. In the conflict-affected areas of the northeast, agricultural labor incomes will be well below average as conflict limits area cultivated and household willingness to participate in agriculture activities. Market supply of cereals: Market cereal supplies will be slightly above average between July and September. This is mainly due to two consecutive years of good harvests, resulting in good trader and household stocks. Traders are expected to continue to off load their stocks through September in expectation of the harvests in October. Between October and December, new harvests will supply markets and improve stock levels. Markets in northeast Nigeria, however, will continue to receive limited supplies due to trader fears and limited local production. Food prices: Staple food prices, particularly for cereals, will remain stable or increase slightly between August and September with the peak of the agricultural lean season. With early green harvests peaking in September, prices will remain stable or decline, increasing food access for market dependent households. A sharper decrease in prices will be seen between October and December, as main season harvest contribute to increasing market supply, and agricultural household demand is at its lowest with the arrival of new harvest stocks. During the agricultural lean season, which ends in September, household food access will be supported by stable market prices for staple cereals and average seasonal incomes for most of the country. Harvests continue in the bimodal south for first season cropping, and early green harvests will begin to emerge in northern states in late August, early September. Despite the late start of season in central and northern regions, and the forecast for below-average precipitation in southern areas, households in most parts of the country are expected to benefit from average main season harvests, which begin in October. New harvest stocks will also contribute to good markets supplies and a seasonal decrease in market prices. Due to below-average purchase prices for staple cereals and good sale prices for livestock, most pastoral households will experience favorable livestock-cereal terms of trade through the end of the year. Between July and December 2015, most of Nigeria will be in Minimal (IPC Phase 1) acute food insecurity. Northeast Nigeria, however, continues to experience conflict-related restrictions to food access and availability. Worst-affected resident households and IDP populations have limited to no access to their typical livelihoods. Market activity also continues to be disrupted and purchase prices for staple foods remain high. Between July and September, seasonal incomes will be below average as conflict keeps households from participating in typical agriculture activities and the labor market in urban centers is not robust enough to meet the increase in supply of wage labor from IDPs. Main season harvests, which will begin in October, are expected to be significantly below-average for the third consecutive year in the northeast, limiting household availability of own production stocks, as well as market supply. Between July and September, Borno State, as well as much of Yobe and northern Adamawa States will be in Crisis (IPC Phase 3), with worst-affected areas, including Maiduguri IDP settlement areas, experiencing Emergency (IPC Phase 4) acute food insecurity as households face larger food consumption gaps. Although October harvests will improve food availability somewhat, much of Borno State and parts of Yobe and Adamawa States will remain in Crisis (IPC Phase 3) between October and December as households continue to face difficulty meeting their basic food needs.